I’ve almost completed my review of Videostrong K1 Plus Android box powered by Amlogic S905, and while there are many shortcomings, 4K video playback is actually pretty good with Android’s Video Player (Kodi is not really usable @ 4K). big_buck_bunny_4k_H264_60fps.mp4 (H.264 @ 60 fps – MPEG1/2 and AC3 audio) – Video looks somewhat OK, but big audio delay or AV sync issue. BT.2020.20140602.ts (H.265 Rec.2020 compliant – AAC audio) – OK (First time I can play this video on any hardware). 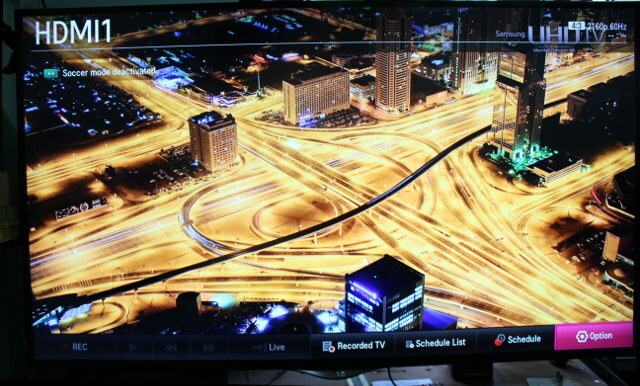 Samsung_UHD_Dubai_10-bit_HEVC_51.4Mbps.ts (10-bit HEVC / MPEG-4 AAC) – Perfect! Astra-11479_V_22000-Canal+ UHD Demo 42.6 Mbps bitrate.ts (10-bit H.265 from DVB-S2 stream) – Most of the time OK, but it will freeze and the same exact point every time for several seconds. You can watch the tests in the video below. I have to say I’m pretty pleased with 4K support on Amlogic S905 so far. 4K H.264 @ 60 fps and VP9 are simply not supported by the VPU in Amlogic S905 SoC, and the only problem I’ve seen with regards to video was with the DVB-S2 stream bug, which could be software or hardware, with the latter requiring a new silicon revision. Only time will tell. That’s not to say there’s still some work to be done, as DTS and Dolby are not supported in the device I tried, and if you are interested in Kodi, you’ll need to be a little more patient. You can find links to the videos in the comment section of this list of video samples. Isn’t the hardware acceleration in MX Player using the same libraries / API as Video Player? No, MX Player uses android lib wrappers for hw acceleration and that works on recent 905 SDK. Didn’t before. All the websites that sell android boxes with s905 inside claim the DTS and AC3 are supported. Does it mean they lie? Also, does Kodi also fail to play those audio codecs or does it have some internal library that can handle them? Do you update the firmware before do this test? Can you post which firmware have you use? Is 10bit depth only decoded or truly displayed also? If your TV has good info menu, you can check bit depth of HDMI stream. Must be YCbCr 4:4:4 30bit or 36bit (not 24bit). Maybe there is somewhere a test video with 10bit color gradients. Easy to see difference if truncated to 8 bit. Does S905 have stupid DTS/Dolby passthru blocker, same as in other low-cost models? Is there a planned S9xx variant with enabled passthru? Or only a problem in early firmware? My TV don’t display much info, but my AV receiver (Onkyo TX-NR636) does, and input is: YCbCr 4:4:4 24-bit. I have not gone through the AV receiver specifications yet, so I’m not sure whether that’s the max the box can achieve, or a limitation by the AV receiver. AC3 and DTS pass-through is OK.
My Sony UHD set tells me the input format is 1080p 12 bit when I watch the Blu-ray player output via the Onkyo, and the Onkyo reports YCbCr 36bit 1080p as its input and output format via its OSD. HOWEVER – some UHD sets will only accept 8 bit video at 2160/50p and 60p resolutions even though they will accept 10 or 12 bit at 1080p or less, so that might also be an issue? I assume these tests are played from a USB harddrive? Is it possible to use the native player with media from a NAS (samba)? otherwise that’s quite a show stopper for 4K playback for LAN based media. What is the native player ? Stock Android, Custom (made by each box maker) or something else? Basically it does not work well on VideoStrong K1 Plus with 50 Mpbs+ videos, but might work better on MINI MX due to Gigabit Ethernet (checking this soon). Also switching from SAMBA to NFS or some http protocol would provide better results. It looks like the same default video player as in Android phones. @Stane1983 another mention of another “better” S905 revision. I hope someone is going to flag up when and how to identify these revisions? It’s certainly put me off buying this year…. @cnxsoft Unfortunately the GUI of other android media players (eg MX Player, BSplayer VPlayer, VLC) aren’t very family friendly in their presentation/operation unlike Kodi, especially for network playback. but if Kodi doesn’t work that’s a major issue too. Archos Video is the best of the rest that suits network playback needs so far. Smooth at 4K resolution and 7.1 sound. KODI player from USB HDD. @INPHIC nice tease. Is that a using your own custom build of Kodi? What else can you tell us about your media player ? Glad to see you are testing it on an LG television since you are using quite a bit of LG 4k material. Thanks from LG! Can you test the box with 10-bit h264 anime (Hi10P)? They are normally decoded in software… But perhaps the AmLogic s905 is fast enough to decode it. TV boxes based on Rockchip RK3229 should support Hi10p. How work kodi? Can I play a hevc 2160p 10bit with it?